Prepare for the arrival of the Tranquility node by attaching cables between the starboard truss and the Unity node, the area where Tranquility will be installed. 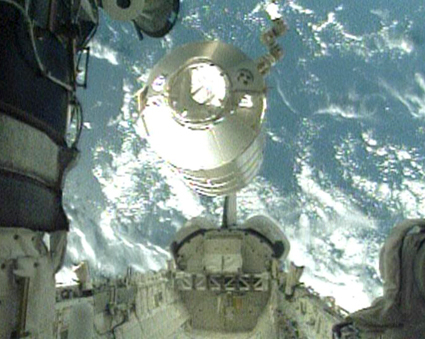 Tranquility is targeted to arrive to the station on STS-130 in February 2010. The spacewalkers also will replace a communications sensor device, install two new GPS antennas, and install a new circuit breaker. Flight Day 5 began Tuesday shortly before 1PM EDT Tuesday. ISS and Shuttle crewmembers unloaded equipment from Discovery, including the COLBERT treadmill. 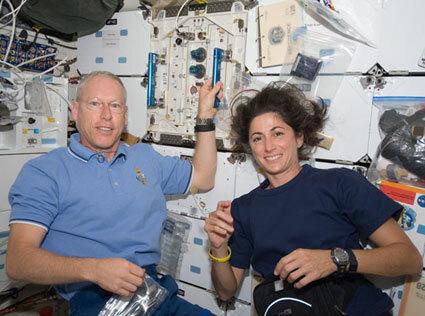 Danny Olivas and Nicole Stott (now a member of ISS Expedition 20) spent 6 hours and 35 minutes outside the Station on the first EVA of the mission. The astronauts removed a 1300-lb (589 kg) ammonia coolant tank from the Station, and retrieved science experiments which were mounted outside the Columbus lab. Mission Specialist Danny Olivas and Expedition 20 Flight Engineer Nicole Stott completed the first spacewalk of the STS-128 mission at 12:24 a.m. EDT Wednesday. The astronauts began the spacewalk at 5:49 p.m. Tuesday. During the spacewalk, shuttle Commander Rick Sturckow and Mission Specialist Pat Forrester guided the spacewalkers through the procedures. Pilot Kevin Ford and Flight Engineer Bob Thirsk operated the station’s robotic arm. Crew members inside the International Space Station entered the Leonardo Multi-Purpose Logistics Module and unloaded the air revitalization system, a new crew quarters compartment and the Combined Operational Load Bearing External Resistance Treadmill (COLBERT). Flight Day 4 pics and video are up at the JSC Gallery. More clips at Space Multimedia and BBC. Live video at SFN. Discussion at Nasaspaceflight. Check the links at right for play-by-play and NASA TV. For the second time in history, thirteen people will be assembled on one spacecraft today to kick-off eight days of joint space operations. 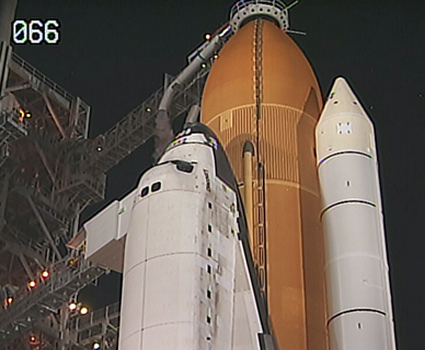 Space shuttle Discovery is on track for a docking with the International Space Station just after 9 p.m. EDT. Commander Rick Sturckow and Pilot Kevin Ford will perform a few final corrective jet firings to refine the orbiter’s path to the station and poise them for a rendezvous pitch maneuver (RPM) under the station at 8 p.m. While Sturckow performs the “backflip” Expedition 20 Commander Gennady Padalka and Flight Engineer Mike Barratt will take photos from the station. Their photos will be reviewed by experts on the ground for evidence of damage to the shuttle tiles. Once the RPM is complete, Sturckow will fly Discovery ahead of the space station and slowly back it in to dock to the station. Mating is expected to occur at 9:04 p.m. After hatch opening and a routine safety briefing, the two crews will start their joint operations. Flight Day 2 pics and video are up at the JSC Gallery. More pics and video at KSC, and clips at Space Multimedia. Live video at SFN. Discussion at Nasaspaceflight. Check the links at right for play-by-play and NASA TV. "...and LIFTOFF of Discovery, celebrating its 25th birthday by racking up science and supplies to the Space Station!" "...Discovery speeding straight as an arrow on its night flight toward a date with the International Space Station Sunday night." Live HD webcast at SpaceVidCast. Preflight pics are up at JSC, and Sentinel. Launch blog at NASA. Pics and video at KSC. More clips at Space Multimedia. Live video at SFN. Discussion at Nasaspaceflight. Check the links at right for play-by-play and NASA TV. 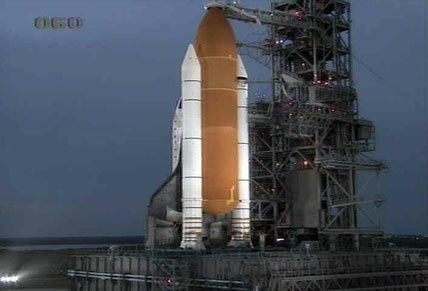 The launch team is targeting Friday night for the next launch attempt of space shuttle Discovery on the STS-128 mission. Launch time for is 11:59[PM] EDT. Live HD coverage at SpaceVidCast. Live video at SFN and ESA. Discussion at Nasaspaceflight. Preflight pics are up at JSC and Sentinel. Launch blog at NASA. Pics and video at KSC. More clips at Space Multimedia. Check the links at right for play-by-play and NASA TV. NASA has tested and cleared the fuel valve which caused Wednesday morning's scrub. There are four more launch opportunities to get Discovery off the ground before the Shuttle program has to step aside to allow the Air Force to use the range for a military launch. Two of NASA's opportunities actually occur within the same 24-hour period this Friday - one at 12:22AM EDT and the next at the other end of the day, just seconds before midnight. The launch team is targeting Friday morning for the next launch attempt of space shuttle Discovery on the STS-128 mission. Launch time for Friday is at 12:22 a.m. EDT. Commander Rick Sturckow will lead the Discovery crew with Kevin Ford serving as pilot. Also serving aboard space shuttle Discovery are Mission Specialists Patrick Forrester, José Hernández, John "Danny" Olivas, Nicole Stott and the European Space Agency's Christer Fuglesang. The seven astronauts will fly Discovery to the International Space Station and deliver Leonardo, a Multi-Purpose Logistics Module, and a Lightweight Multi-Purpose Experiment Support Structure Carrier in addition to science and storage racks. Stott is scheduled to join Expedition 20 as flight engineer and Tim Kopra will return to Earth with the Discovery crew. Put a pot of coffee on and stay up late! Live HD coverage at SpaceVidCast. Preflight pics are up at JSC and Sentinel. Launch blog at NASA. Pics and video at KSC. More clips at Space Multimedia. Live video at SFN and ESA. Discussion at Nasaspaceflight. Check the links at right for play-by-play and NASA TV.